Dennis is known amongst many other things for his participation in the “Hoasca Project” – a pioneering effort to document and understand the pharmicokinetics and effects of Ayahuasca in the Brazilian Amazon. 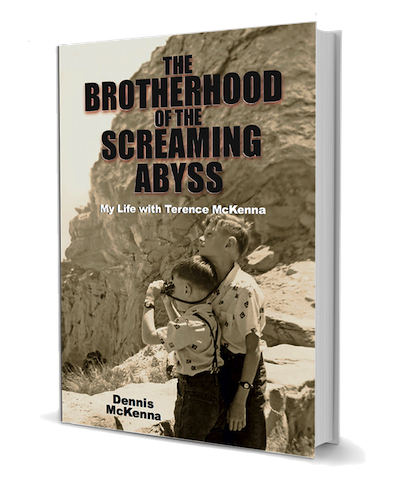 BTW, Dennis’ book was funded through Kickstarter, the crowdsourcing site. It was the most successful book project in Kickstarter’s history. When we contemplate working with Ayahuasca, we must be prepared to encounter the darkness as well as the light. This is one of the most sacred and valued aspects of working with the medicine. As I prepare to return later this year to the Amazon to work with Ayahuasca once again, I’ve been looking at some of the prep work I did a few years ago, prior to my first encounter with the great spirit medicine. One striking thing (especially looking at it now, long after the fact) was an I Ching reading I did a few months before I left for South America. I see and use the I Ching (the ancient Chinese life guidance oracle system) as a “synchronicity system” that reflects our greater selves back at us from outside the normal time stream. This can inform in ways that are surprising, especially if there is an emotional or life-altering component to the question one asks of the oracle (or rather, of one’s Self). The answer (which I’ll partly quote from my favorite English interpretation of the symbols by Stephan Karcher) was hexagram 36, “Brightness Hiding” (field over radiance). The symbol is of a setting sun, indicating travel through demon’s country. “Brightness Hiding describes your situation in terms of entering the darkness to protect yourself, or to begin a difficult new endeavor. . . Conceal your intelligence by voluntarily entering what is beneath you, like the sun sets in the evening. There is real possibility of injury in the situation. [Meaning the current life situation outside or before this action.] By dimming the light of your awareness and entering the darkness, you can avoid being hurt. This becomes a chance to release from old problems and inaugurate a new time. This passage one takes is not darkness for the sake of darkness – not an evil trip with no purpose for the voyager other than harm and fear. With Ayahuasca in particular, it is always a purposed passage through the underworld of our soul in order to learn what we are and where our weaknesses come from. We can benefit from this dark passage, this study of our under-structure. If we are shown them, we can better repair the creaking beams that hold up our thoughts, our egos, our presumptions, our social mores and norms, and our very beliefs. We can gain a holistic view of ourselves that will inform us once we are back in our ego-based persona, ingrained in the consensus reality flow of our “normal” lives. This is not an easy or comfortable journey, this trek through the basement of our being, but it can bring us great value if we consent to do this work. The thing with Ayahuasca is that you will encounter this trying but important task, but you won’t control when it happens. Therefore, one must be ready for it at any time and we must truly and heartily consent to do this work from the beginning. The rewards are definitely worth the real work we do and the apprehension we naturally feel as we approach the mouth of the dark cave of ourselves.